Fosmon's low-voltage wall plate mounting Bracket is designed specifically for the installation of low-voltage cables and wires in walls. The backless design accommodates the space needed for speaker wires, coaxial, HDMI and data/communication cables. Perfect for surround sound systems, banana wall plates, HDMI wall plates and coaxial wall plates. Designed to mount wall plates flush with the wall. Installation is as simple as TRACE, CUT and INSTALL. Utilize the inside of the bracket as a guide to trace and cut a hole on the wall. Adjusts to fit various wall thicknesses from 1/4" to 1" thick. 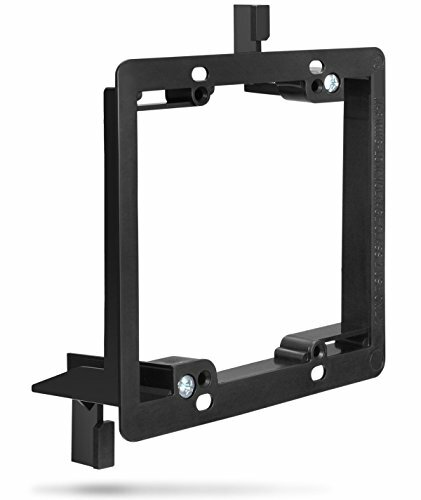 2-gang bracket opening measures 3.625" x 3.5"
Fits wall thicknesses from 1/4" to 1" thick. Compatibility: Use it with any low voltage wiring such as telephone wires, network cables, HDMI, coaxial and speaker cables. Great for use with banana, HDMI and coax wall plates.